While I love the overall design, this particular folder is way out of my price range. Even if I could afford it, I am not sure I could actually bring myself to use it, so this is definitely on my no buy list. I certainly won’t deny that it’s an expensive knife. If you get a chance to handle one I think you would be impressed. Mr. Random, you should save up and get this knife. It’s worth every penny. Spyderco always does a great job with knife to price ratio. I got mine a few weeks ago and I’m using the hell out of it. I didn’t like the hollow grind, so I put a flat grind on it. It cuts even better. You should try forums since they’re a bit cheaper, or buy it used. I got mine used, and it feels brand new. It’s a nice alternative to the more expensive knives since you get the quality without the price. I have to admit I have really been enjoying mine as well. I know price is always a concern for people but this is one of those cases where you get what you pay for. How do you think the Southard compares to the much beloved Paramilitary 2? Can you do an apples to apples comparison with differences in cost and steel aside? I ask this since there are PM2 sprint runs with comparable steels that cost about the same as the Southard on the secondary market, i.e. the M390 PM2. Shannon they are very different knives in terms of build quality, thickness, and weight. The Southard is much better built, way beefier hardware, better materials, better fit and finish. Practically speaking they will both fill similar roles. I see the Southard as much more of a collectible (for my purposes at least) while the PM2 is more of a beater / user knife. If I had the choice between the Southard and M390 PM2 I’d take a Southard any day… just my opinion however. Nice work on this review. I’ve been kicking around the idea of getting one. I’m not much of a flipper fan because of the grip you have to use to flip it open. I’d much rather spyderco made the spyderhole more useful (and thereby making is useful for lefties). Thanks, JT! I’d like it if this one was a little more lefty friendly as well (at least as far as the thumb hole is concerned), but I guess to make the knife not look like every other Spyderco they had to change it up a little. Thank you, Mykola! My pleasure! Yet another fine knife by Spyderco. Many years back I didn’t care for their TM hole design but FF to now and I find myself with more Spydies than any other brand. They just plain make very well thought out knives that work. They typically cut better than their peers because of their use of better cutting grinds along with narrower angles which is ultimately what a knife is for. They tend to not be too flashy, instead opting for graceful and functional blades. However, this one time I chose the ZT 560 over this and the Gayle Bradley. Why? A bit because I don’t have a ZT but also the 560 just seems to be such a good deal with so much going for it, not to mention it looks stunning. The ZT just checked every box of build quality, design, technology, and features. Perhaps I’ll get this down the road but for now I’m happy with my ZT for a heavy duty folder. Thanks for stopping by, man. Amen on Spyderco – they make great stuff. I see your point with the 0560 and totally respect that. It is one hell of a knife. Good review. For me this knife is as close to perfect as a edc knife comes, whether production or custom. Everything is spot on in my book. Quality is bar none for production, weight is perfect for me ( I don’t like light or heavy knives), hollow grind is my preferred edc grind (despite what some fancier people think), and the steel is a close tie for my favorite with benchmade’s m4 contego steel. Only thing I think it lacks is a stainless steel lock bar insert. Thank you, Andrew. Glad to hear you like your Southard Flipper. I like this knife. Taiwan is certainly capable of quality manufacturing. They have my respect on that. However, I would not spend anywhere near that much on a knife. Let alone one that isn’t made in the USA. There’s a line between practicality and vanity. Fair enough, John. I agree that you can get something just as functional for a fraction of the price. It’s a luxury. 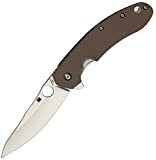 No one “needs” a Spyderco Southard, in the same way no one “needs” a Rolex, or a BMW, or any other luxury good. It is funny to me that people whine about the price of the Southard especially at a full retail of over $400.00 and an average of $220 to $250.00 online but then again those that are whining about the cost of the Southard are the same “Tacticool” dudes that spend that kind of money on slippery modeled ZT knives which I feel are HIGHLY overpriced and I am in the cutlery industry for 37yrs and sell ZT’s. But ZT like Striders and Hinderers are the kind of knife that you spend more buck for less of a practical bang! The Southard is better than the above forementioned knives and designed by a master by the name of Sal Glesser! I own one! I carry it! I use it! I like it alot and I am a hollow grind fan as it is the BEST cutter style grind out there! Cutter and nothing else!